Orphaned Crispin Thorne has been taken as ward by Philip Smallwood, a man he’s never met, and is transplanted from his private school to Smallwood s house on an island on the beautiful but coldly remote, Horsey Mere in Norfolk. Upon his arrival, he finds that he’s not the only young man given a fresh start. Myles Graham, and Jude Middleton are there before him, and as their benefactor is away, they soon form alliances and friendships, as they speculate on why they ve been given this new life. Who is Philip Smallwood? Why has he given them such a fabulous new life? What secrets does the house hold and what is it that the Doctor seems to know? 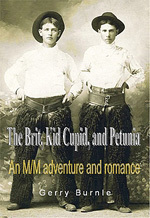 Trust acclaimed author Erastes to tell a moving story in the field of gay historical romance. About the author: Erastes is the penname of a female author who lives in the area where this book is based. Author of seven books and twenty short stories, this is her third full-length novel. A Lambda award finalist and keen lover of history, she began writing full-time after leaving the legal profession finding it stranger than any fiction. 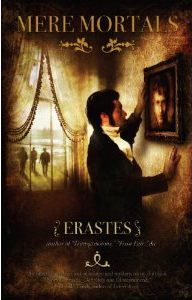 When it comes to man-on-man, historical romance and adventure, the name Erastes invariably comes to the fore, and her latest creation, Mere Mortals [Lethe Press, March 23, 2011] is perhaps her best effort yet. It is in my mind, anyhow, and I’ve read and reviewed many of her novels and short stories in the past. Ergo, in one deft stroke the author sets the tone, the pace, the theme, as well as introducing the narrator and some of the characters. This is writing at a very high level of the craft—almost a textbook example—and it is why Erastes has earned the respect she enjoys. Mere Mortals is very much a Gothic story with the requisite manor located on a bleak mere, secret passageways, sphinx like servants, and a handsome but mysterious master. All of them playing their parts delightfully, as do the three boys. There is tension, too; plenty of it. Tension that is velvet-wrapped in mystery. It permeates the atmosphere but never becomes blatant or oppressive until it surfaces near the end; when the secret of Bittern’s Reach is revealed. If you are a fan of M/M romance, historical fiction or Gothic tales, all superbly written, then Mere Mortals is bound to please on all counts.